Originated with the Morden Research Station, Agriculture Canada, Manitoba, selected and tested as Morden 352, and introduced in 1952. The tree is moderately vigorous, broadly upright, round-headed, annually productive, with strong wide-angled branches. It is hardy to Zone 2b, and moderately resistant to fire blight. The fruit is medium size, 4.5 cm (1.75") in diameter, oblong oblate, log stemmed, with shallow stem cavity and basin, and matures in late September to early October. The skin is creamy yellow, completely covered with crimson and later maroon, and covered with a medium bluish bloom. The flesh is yellow and tinged with red, very firm, very crisp, very juicy, somewhat tart but very sweet. It is very good for fresh eating ( better with storage), excellent for cooking and canning, and superb for juicing. It has excellent storage capability for up to 27 weeks. These apples can take a pretty hard frost (mid 20's?). While good to eat fresh off the tree, they will be better to eat out of hand after storing for a few months. They are very crisp and get a very dark red color when ripe. Our tree put on a full crop after 6 years of waiting, so we'll be able to see if they really store for 6 months in our root cellar. I am happy to report that they do indeed store for 6 months. We still have few in the root cellar in late April. Stored in grocery store apple boxes, the ones on the bottom layer of the box have not dries out as much. The cores are browning, but they are still quite edible, and a lot sweeter that when harvested. Ripens late September. From the USDA Germplasm website: Fruit: size 4 cm (crabapple), green to solid dark purple-almost black. Flesh: yellowish, flecked with dark red; good canning good keeping to early January. May be regarded as large Dolgo but with a milder flavor. Vigor fair, yield good. Walter Manchester notes, "Tree ripened fruits become dark purple-red with heavy dark bloom. Exceptionally juicy and sweet. Resistant to browning. 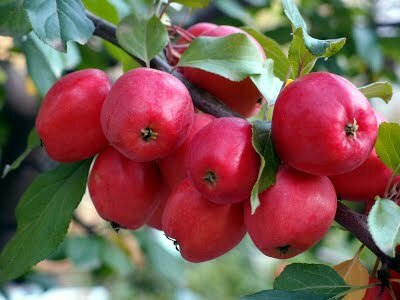 Fruit will stand late frosts while on tree.. does not drop." White flowers.